Today we had a light dinner. 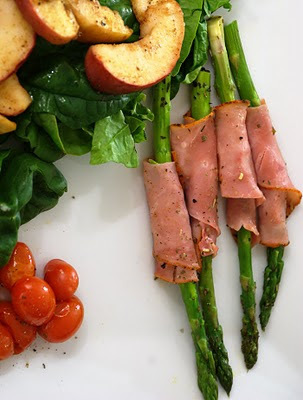 We wrapped some asparagus in sliced ham and roasted it with cherry tomatoes. Add the same time we baked apple slices that were tossed with curry powder, cumin and cinnamon. The dish was very simple but all of the flavors really went well together. It was light and original.